Book Family Farm chickens are raised outside on the grass and in the sun! We supplement them with soy free organic feed. Their yolks are deep orange/yellow which shows that they are eating what they were intended to eat and high in Omega 3's as well as vitamin A and D. Better even than their health benefit is their superb taste. Once you taste a truly farm fresh egg there is no going back. 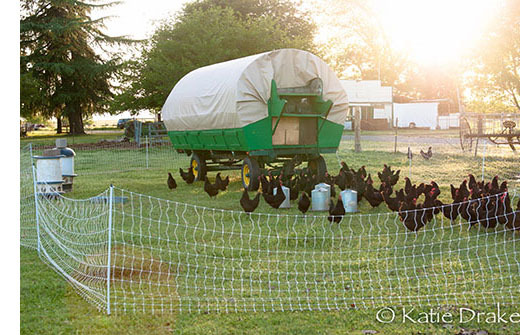 Our chickens roost and lay eggs in a mobile chicken house that moves to a new place regularly. This is an advantage for the chickens because they have a new place to range and a new "salad bar" to eat each day. This also helps us take advantage of spreading their chicken manure around the farm to fertilize our soil. Our eggs are only sold here at the Book Family Farm. Quantities are limited. Email us before you come so that we can reserve some for you bookfamilyfarm@gmail.com but the best chance to get these delicious eggs is by monthly subscription. You pay monthly and we reserve eggs for you to pick up each week at your convenience.